There’s no such thing as a best church in Vancouver. When it comes to faith, it’s about family and it’s not a competition for the best or biggest church. While there is no such thing as the best church in Vancouver, there are many good churches in Vancouver and many choices available. At VancityAsks.com we hope to help locals and tourists find the best of Vancouver. Since there isn’t such a thing as the best church in Vancouver, we’re going to share some things to consider for when looking for a local church along with five good churches for your consideration. Perhaps, you’re new to the city and looking for a Vancouver church. Maybe you’re simply looking for a community to grow, we hope the following list can help you along. Enjoy reading. If you’re non-religious, feel free to skip on to another article. If you’re looking however for a supportive community founded in Love, I hope you consider reading the list and stepping into one of these cathedrals (building, community centers, or theatre nowadays). It may be the missing piece you’re looking for to fill that emptiness or desire? Note: The church is His body and I believe He cares about it. Shouldn’t you? It’s the longest living organization on earth that has planted schools, advocated for education, advanced science, and built/staffed hospitals. (Look at St. Paul’s if you need a local example) It cannot be under emphasized that if you’re a Christian, you should get connected and serving in a local church. I cannot think of a government or society group that has made as much an impact globally than the Church. I believe the local church is one of many ways that God uses to help humanity and add to society tangibly, an expression of His care and His love. If you want to experience the full power of God then be connected to a local church; it’s the dispensation that it comes through imho. Much like how the feeding of 5000, the people set in groups (organization), and the disciples (church) distributed the food. The miracle was from the Lord, but the disciples were used and order was present. Order as you will find is very important for progress. Order such as the usage of gifts through the church. How to find a good church in Vancouver? As I mentioned, there is no such thing as the best church in Vancouver. There are many good options for community and fellowship. Here are some things I look for when trying to find a church in Vancouver. It’s by no means a definitive list but what I believe are important points. Christ Centered church: Look for a church that emphasizes on the finish work of Jesus Christ and the second person of the God-head. You don’t have Christianity without Christ. It’s about God’s love towards humanity that He sent His Son; it should not be only about our frailties or God’s judgement. Biblically based: A church should be grounded in the Bible. While I believe there’s an importance to relevance in society, it should be in context of the Word. Church goers did not go to church to hear what reader digest said about modern culture – they already do that in the washroom. New Covenant: In my humble opinion, it’s important that the church emphasizes on the New Covenant or grace. All books of the Bible are important for the full counsel is necessary and every word of God is profitable for teaching, rebuking, and training in righteousness. Let’s show the world love and grace because we have first been recipients of this love and grace from Him. Community: Finally, community cannot be understated. We all have a longing to belong; maybe this branches to our desire to achieve, and to succeed. If Christianity is about a relationship with God then you would know your horizontal relationships matter as well. Unfortunately by virtue that we’re humans and we make mistakes (sometimes wilfully), some people have been hurt by the church community itself. This should not mean that you put yourself at a distance from community always but maybe find another community. Now that I’ve underlined what has been considered when creating the list of churches in Vancouver, here are some good churches for you to consider visiting. Broadway Pentecostal Church Vancouver: Broadway Church in Vancouver is a modern church under the Pentecostal Assemblies of Canada and shepherded by lead pastor Darin Latham (who was a former police officer in Toronto area and enjoys apologetics). Broadway Pentecostal plans their sermon series at the start of the year on different topics varying from money management to hung-ups; these effectively finding biblical answers to are life topics. Broadway Pentecostal Church in Vancouver features a diversified international community comprising of many mature families (children in high school or universities) with elders and younger families. They don’t have a very active community group program at Broadway Pentecostal Church but feature other programs. Broadway Pentecostal church also runs various programs such as a day care and City Reach society (a separate non-profit association affiliated with Broadway Church) as well as contributing to the YVR airport Champlain program. Broadway Pentecostal church at 2700 E Broadway. Picture taken from Google maps, street view. Willington Church Vancouver: Willington Church Vancouver is another Mennonite Brethren church just outside Vancouver in Burnaby by Metro-town area. It’s headed by pastor Mark Loewen and one of the largest church in the Vancouver area. I have not personally visited this church so don’t have much further information about it but I have had many friends who attend this church and enjoy the diversified community of people. Willingdon Church at 4812 Willingdon Ave. Picture taken from Google maps, street view. 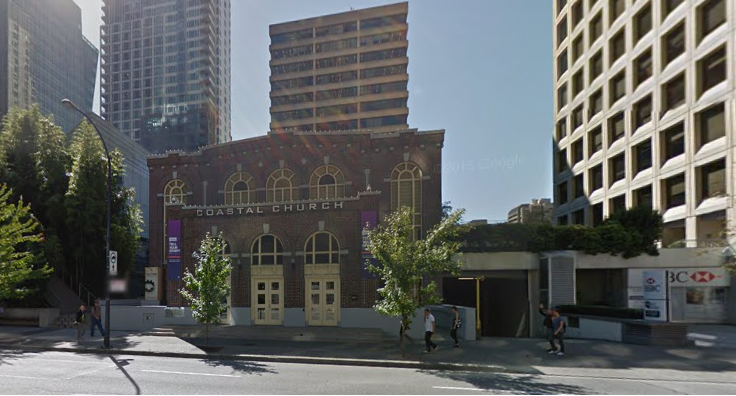 Coastal Church Vancouver: Coastal Church is a non-denominational church in downtown Vancouver right in front of the Trump tower. The church’s lead pastor is Dave and Cheryl Coop. Coastal Church in Vancouver likes to ensure their sermons are relevant to modern living and the hub city of Vancouver (where people regularly transit in and out). Their self-professed mission at the church is to make the city of Vancouver a better place. Coastal Church has a strong emphasis on community with life groups running throughout the year in cycles on different topic or sermon. Congregation is comprises a lot of students and working adults and couples in downtown Vancouver. The church also encourages entrepreneurship and positive thinking. They have a strong online presence and social media team which is unusual for a church. Services run weekly on Saturdays at and Sundays at 9 AM, 11 AM and 12:30 PM for about 1.5 hours, an introduction followed by a brief 45 minutes sermon between worship. Coastal Church is built in a historical building on 1160 West Georgia Street where you can see drawings of the old architecture of the building pinned in the hallways. They provide free coffee, apples, and snacks after service and also have a kiosk that serves ice cream, fresh squeeze orange juice at a nominal cost. Coastal Church in Vancouver, BC. Picture courtesy of Google Maps, street view. Here are many other churches in Vancouver. West Coast Christian Fellowship: WCCF was suggested on our Facebook post. They are a non-denominational church affiliated with Salt & Light Ministries (http://www.saltlight.org/international/). Their statement of faith can be found here. Services start at 11:30 AM on Sundays. Salvation Army Cariboo Hill Temple: Located in Burnaby, Salvation Army Cariboo Hill Temple was suggested as well on our Facebook post. I was not able to find mentions of their denomination but I would assume affiliation to the Salvation Army? Their statement of faith can be found here. Services run on Sundays at 10:30 AM and 6 PM. Bethel International Church: Bethel International Church was suggested from someone on our Facebook page. Services appear to be at 10 AM on Sundays. Not affiliated to Bethel music. Redemption Church: Formally Point Grey Community Church which was joint with another church to form Redemption Church. They are a Pentecostal church with affiliations to the Pentecostal Assemblies of Canada. Services run on Sunday at 9 AM and 11:15 AM. Relate Church: Relate Church was suggested by several on our Facebook page as well. Otherwise known as Victory Christian Centre, this congregation was renamed to Relate Church in 2009. It appears that Relate Church is affiliated to Hillsong Churches (Pentecostal) and have adopted a similar vision with the “Church that I see”. Services are on Saturdays at 5:10 Pm and Sundays at 9:40 AM along with 11:40 AM. Trinity Central Church: This church was also recommended by someone on our Facebook page. It’s a new church in Vancouver seeking to impact this city with the message of the gospel. They are part of Newfrontiers family of churches. Trinity Central Church meets in the Vancity Theater on Sundays at 10:30 AM. Think for yourself – I’ve heard it spoken before, “do not leave your brains at home when you come to church”. Remember to think for yourself. Church is not a place where you ignore logic or thought processes; God created your brain as much as he created you. Do not let anyone else think for you; esteem the teacher but do not regard anyone more highly than you ought. Christianity is not a brainless religion; that’s a cult. Christianity is about relationship between a Holy God and humanity saved by grace and love. Many of the greatest philosophers and individuals in academia are Christians. Adding or Taking – Be careful when people make deviations from the Word. There are minor and major disputes as in life there are disagreements of opinion and interpretations although the crux of the gospel and the God-head should not be disputed neither should the instructions in the Bible be contradicted. I believe God has made us all with an intuitive desire for worship and community. This leaves room for error when the desire is abused. In my opinion, this is why Cults and religions can catch on so successfully when people add or take from the Bible for their own profit. For example the “children of god” cult that abuses the name of Jesus for sexual exploitation but completely ignores the Bible talks about sexual purity and lust. Living in society with different believes requires acceptance but not compromises. Yes, compromise is necessary in daily life for a cohesive society though compromises should never be about Truths or facts. Every individual is unique and different. Take the metaphor of plants, one plant may grow better in red soil with higher iron while another plant may grow better in soft, fertile soil with a lot of peat. I hope you find a good church in Vancouver and you enjoyed this article. Note while denomination should not be a divisive factor, we have noted it because denomination represent slight differentiation in interpretation of certain scriptures or preferred style of worship. I find you may be more familiar or comfortable with a church that matches your denomination (upbringing or preference) enabling for fellowship in your community. The purpose of this list is to help new Christians in Vancouver find a church they can get connected to and begin living life, growing, and serving the community and city at large. Westside Church: A Christ-centered Mennonite Brethren church right in the heart of Vancouver pastored by pastor Norm Funk. This church has a history of going through books of the Bible for sermon series with relevance to modern living. It’s a great church that you can be sure is giving sound doctrine. The community is friendly comprising of yuppies, young families, young professionals, and students. Westside also has a church in North Vancouver headed by pastor James Bonney. They run life groups throughout the year allowing for more tightly knitted fellowship in small groups. Services throughout the year meet at 9 AM and 11 AM on Sundays though only one service per week during the summer at 10 AM on Sundays as well. The congregation is fairly large – may be the largest downtown Vancouver church with several thousand members. The Vancouver campus also features a cool café serving tea and pastries before and after service. It’s definitely one of my favourite churches in Vancouver. Westside Church at 777 Homer Street in Vancouver, BC. Picture taken from Google maps, street view. March 27, 2018 – I have some concerns personally regarding Westside Church’s doctrine and cultural values, while listening to a few audio sermons and have temporarily removed it from our five good churches list while prayerfully considering the matter. Cultural and doctrinal concerns. For such reasons, I cannot in good conscience recommend the church for the benefit of the Church. May 15, 2018 – I will be keeping Westside Church off our recommendations for churches in Vancouver in good conscience. Didn’t actually take a month to decided but was reluctant to change anything on this article because it was written after a time of prayer (inspired thereafter to write this initial article as above which was finished in an hour – typos and all Haha). I will be keeping Westside Church on the other churches in Vancouver list. Westside Church has at various times taken a stance again nationalism; while I believe, ultimate allegiance is to Christ, I don’t think it is beneficial but rather divisive to take such a stance against nationalism. (Not intending to bring race into the matter but I think it’s easy as a majority Caucasian leadership with North American origins to overlook this matter but those who have grown up in Asian heritages are taught the importance of remembering those before and of heritage, respect, and honor. “Christianity is the religion by which I live my life, but I continue to draw insights from and be guided by Chinese philosophy. Harmony is the goal of Chinese philosophy. It stresses harmony with oneself, harmony with nature and harmony with humanity” – David Lam) The Bible says every nation and every tongue – there is still a distinguishing between nationality and language but a unity in the body of Christ. They also take an unusual stance against commerce that Christians cannot accumulate any wealth but I would much rather see my brother with the wealth properly stewarded than not. I have several other observations that resulted the decision but I am very very cautious about what I write negatively of any church (not to say my opinion matters per say). I am also inclined to think they believe in replacement theology but the Bible says the gifts and calling of God are irrevocable further saying “God has not forgotten His people”. I also observe concerns about some sermons which have suggested believers visit temples and shrines for the “cultural experience”. As someone growing up in Singapore, where religious and racial harmony is emphasized. where Buddhist temples are common, I am not at all against temples or other religions however I find it hard to imagine reading the Bible about how God chastens the children of Israel not to learn from the Baals and to shun idols that it would say “when you go into the land I am giving to you, seek it out, observe their idols, and learn from their temples for cultural experiences for you will worship me as they worshiped their gods” (the Bible doesn’t say it – it actually says the opposite). Further with regards to nationalism, Paul intently spoke, “For though I am free from all men, I have made myself a servant to all, that I might win the more; and to the Jews I became as a Jew, that I might win Jews; to those who are under the law, as under the law, that I might win those who are under the law; to those who are without law, as without law (not being without law toward God, but under law toward Christ), that I might win those who are without law; to the weak I became as weak, that I might win the weak. I have become all things to all men, that I might by all means save some. Now this I do for the gospel’s sake, that I may be partaker of it with you.” There are different fractions, nationality, and races of society – to each one is called to one… remain as you are called and be whom the Lord has called you to be. I do not think it beneficial to necessarily white-wash every individual to be bland and boring where nationalism is frowned upon in the church (in Singapore, many church pastors choose to honour government for a cohesive society). I for one, am thankful and glad to say I’m a Canadian emphasizing on Canadian cultural values. People are better reached when there are mutual ground, to be void of all nationalistic identity (or heritage) removes opportunity for connecting with others (or to seek the good of the country). It is not good for the Body and not good for the country of which the Bible says to seek the good of where you are. (both old and new testament) Nationalism is necessarily for nation building. I also have observed a lack of brotherly love and community at Westside Church as a few might attest to. The warmth of family; there will always be cliques in any society group however it seems very important to have a wide variety for a broader audience to belong somewhere; why I would also recommend people see out nationality churches like Indonesian Church with Indonesians or Korean Church with Koreans if that is their preference; a direct connection and belonging but ultimately all under Christ as head. So alas, this is the lengthy discourse I wanted to write about why I have removed Westside Church from our recommended churches, not with spite, but in due consideration and prayer. This is a personal article which I hope will help new believers and this is a personal writing not void of errors so please share your opinions civilly bellow if you disagree. I am no theologian nor Bible student, just one who reads the Bible and knows Christ as Lord and Savior. As Elihu said in the book of Job, it is God who gives understanding. What about churches in Port Coquitlam BC? – Four Square North Side: This is quite a large congregation up on Westwood Plateau, I liked it a lot the time I went 5 years ago but there were some concerns. – God Rock: This is a church in Port Coquitlam. A leader from Westside Church Caregroup call BJ preaches there often I think. Services are on Saturday if I’m not mistaken. – Riverside Community Church: This was initially a sister church to North Side Foursquare which branched off on their own. – Westwood Community Church: I attended this church a couple times. It may be a bit uncomfortable for those who are not accustom to free flowing services with dancers during worship time. (had a friend told me he thought the church was uncomfortable for him) It’s right on Westwood. The pastor hosts several events encouraging other pastors to come together. They focus a lot on the Jewish Messianic congregation too. Sorry I can’t be more help with Port Coquitlam churches. Let me know if you have any suggestions for others who may be looking for good churches in Port Coquitlam. There is also the Port Church in North Port Coquitlam that meets at BC Christian Academy school at 10 am on Sundays. 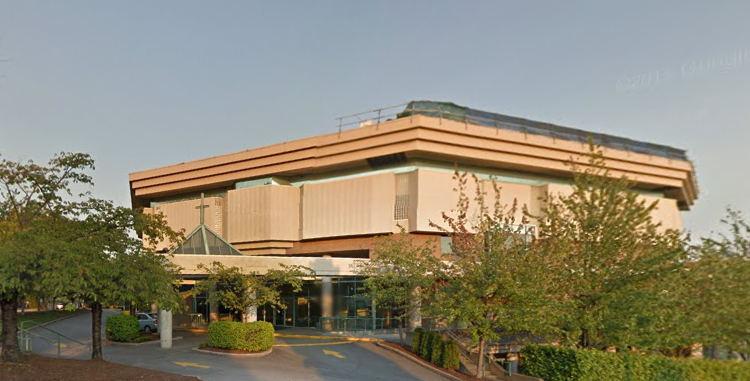 It is a multi-site campus of CAChurch in Coquitlam – a part of the Christian and Missionary Alliance denomination. We would love to see you there. Thanks Sharon. Appreciate the information about Port Church in North Port Coquitlam. Broadway Church now also has a Port Coquitlam campus at 1932 Cameron Ave which was formally Cornerstone Church. Could you provide links to any of the other churches in Vancouver? I don’t often get to Vancouver but I am sure there are more than five great churches. You can’t possible know them all well enough to write about them so a link to other churches would be good. Just a suggestion. Sorry about the late reply. Yes, thank you for your suggestion. I have indeed created a section with “More churches in Vancouver” where recommendations provided by other Christians on our Facebook page is noted. We try to only list recommendations where two or more Christians have suggested (2 Corinthians 13:1 – not the direct application but biblical principles are always a good guide.) so to minimize the chances of listing a church that may cause concern. We’ve actually had mormons commenting on our Facebook post recommending their church despite this article intently warning against deviation from the Scriptures. (We have hidden those posts so that new believers are not confuse). As this post is in part intended to help new Christians to Vancouver find a home church, we want to be a little careful about which church is mentioned. Good fellowship and wonderful worship services and the teachings are awsome. I may not be reading thoroughly enough but I am surprised not to see in your list St. John’s Vancouver (ANiC), formerly St. John’s Shaughnessy but now separate from the Anglican Church of Canada. St. John’s has a world-wide reputation for being faithful to the orthodox and biblical Christian faith and for its fine biblical training and teaching. It is surely significant that one of its long-standing members is Dr. J. I. Packer, well-known author of Knowing God. We have also suffered by losing our church home because we stood firm according to the cautions listed above. Sorry about missing at Irena. Thanks for bringing it to our attention. Will take a look at it. St. John’s Vancouver Anglican Church located at 5350 Baillie Street, Vancouver is by far one of the best Churches in Vancouver. Pastor David Short one of the best Preachers I have ever heard. I have been part of Willingdon Church in Burnaby as well as Broadway Pentecostal Church in Vancouver, but both Churches suffer from a lack of spiritual substance and a too great a focus on entertainment experience. When John Neufeld was the main Preacher at Willingdon Church and Allon Hornby (before he died) the main Preacher at Broadway Pentecostal Church they most certainly were in my top 5 Churches. Thanks for sharing about St. John’s Vancouver Anglican Church. I am glad to hear you’re found a good church in Vancouver that you can attend. I do appreciate your feedback about Willingdon Church and Broadway Church. On a personal level, I am generally very cautious about criticizing any churches who (1) has Christ as their Lord (2) loves God (3) loves people. Each church have their own practice and their own audience; so long as they are staying doctrinal-ly sound (sticking to the Bible as the Word of God), while it may not be the church for you personally with your deeper interest for spiritual food…it can serve a blessing to many others who attend regularly. Broadway Church does simplify their message significantly (generally to convey a simplified key point) however they also offer additional Bible study classes in between services for those who prefer to learn more about scriptures. The simplified message makes it easy for a large population of Vancouver demographic to learn biblical life choices. Although the Bible is so abundant that truly studying the scriptures direct is fruitful (1 Timothy 4:8). Their mission is to produce fully devoted followers of Christ which means bringing people from discovering Christ to centered in Him. Admittedly, the style wasn’t to my preference but it would certainly fit a large demographic of a secular city like Vancouver. Remember the Christian faith isn’t only about one individual but the body of Christ and the wellness of the entire body (1 Corinthians 12 can be applied broadly here I suppose.) I do humbly wish they’d dive deeper into scripture but I’m no clergy so I’m sure they know better. As a personal preference, I do prefer the scripture by scripture study at Westside however each demographic has their different preference and it’s good that there are churches here that try to reach the city of Vancouver. I am not too sure about Willington as it’s the only church mentioned which I haven’t attended. I’ll likely be working on an update shortly when time avails. Thanks for your comment Maurice. By the way, it is Willingdon Chuch and not Willington, named after the Avenue is is located on. And I was part of that congregation for many years. At Willingdon Church they have removed the pews and great sermons and replaced it with individual movie theater seating with large tv screens and very loud music with “sermonettes”. That is why I say that they have adopted the entertainment model for Church. The individual movie theater seating does not even have communion service cup holders for when the Lord’s Supper is served. It shows where their priorities really are! Thanks for pointing out the typo. I’m updating this article shortly and will fix those mistakes. As mentioned, Willingdon Church is the only church on the list I haven’t attended personally but took on recommendations of others I knew. Another church I’ve gone to frequent recently is Tenth Church. Pastor Ken Shigematsu is a gifted communicator. He donates 100% of his book royalty “God in my Everything” to Christian ministries abroad; I find that refreshing with all the profiteering with Christianity. The campus pastor Dan Matherson also freely gave facility use of their Tenth avenue church (around Broadway City Hall station) to House for All Nations church (a ministry catering predominantly to Indonesian ethnicity) when they didn’t have a meeting facility. Will be adding your suggestion to the five list when I update it in March. Another Preacher of small physical stature but a lion in preaching was (is?) Bruce Milne formerly of First Baptist Church, downtown Vancouver. He is my all time favourite Preacher. That’s great to know Maurice. We’ll certainly look into that for our next update. I’ve personally been listening to a few clips of First Baptist Church Dallas by Robert Jeffress recently which I’ve found very intriguing but sound. 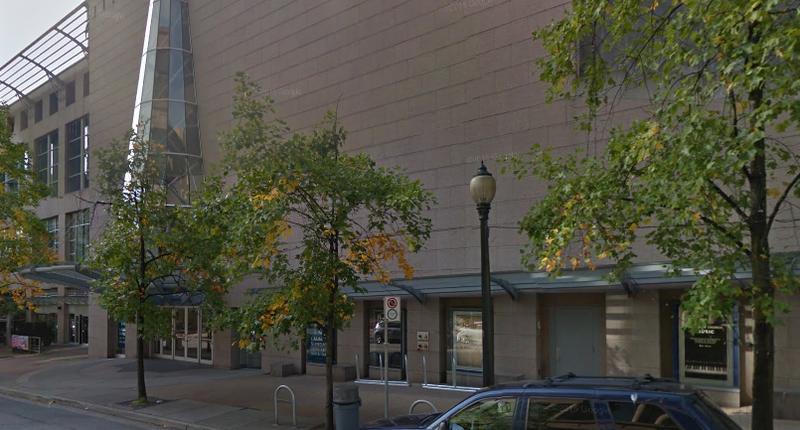 Would be great to check out the First Baptist Church of Vancouver. First Baptist Church of Vancouver is “Arminian” in theology with an overemphasis on what we need to do for Jesus as well as “decisional regeneration” by the individual choosing to believe in Jesus, where the individual’s faith precedes Holy Spirit regeneration, which I believe is in error. You are right in that faith in Jesus Christ alone should be the standard by which we are part of the family of God, but living a sanctified life is a close second in practical terms. We are not to judge about life or death, but we are called to judge rightly and as such we do make decisions on whether or not anything is doctrinal or not and be like Paul when he confronted the Christian Corinthians in his letters addressed to them. Hmm, I was unaware of that Maurice. Thanks for letting me know. I found the preaching of Robert Jeffrey of First Baptist Dallas, while unpopular, is still in accordance to scripture. Absolutely Maurice. I’m sorry it took me this long to write a reply to you. There’s also Acts 17:11 about the Berean Jews, hearing a teaching and checking it according to the Word. I think as the Body of Christ, we ought to lovingly correct any error in accordance to the Word and not to be afraid of being called legalistic (however done first and foremost in love for Christ and love for the Church). Also as the Holy Spirit works in our lives, that we should bear good fruits especially love for the brethren. You should try out St. Andrew’s Wesley United Church on Burrard at Nelson in Vancouver. You will be amazed by the friendly folks, wonderful music and fantastic sermons and our Inclusive Theology! Come for an amazing experience! how about north vancouver or more specifically lynn valley? i was raised without god and im so hungry for religon but i have no where to start. im very confused lol. bless you! namaste 😉 i feel like people might see my past all over my face and judge me. but that isn’t gods love! anyway im babbling lol sorry. You want to be hungry for a spiritual walk with the Lord Jesus Christ. Knowing God is about close relationship with Him where one can share anything, as if He’s your best friend, because He is. Having this relationship changed my life. I wasn’t raised with God either. But God found me and made me His back in 1991. I was 38 years old. I called a pastor and he led me in prayer and I accepted the Lord as my Savior. Before that I was a New-Ager for almost 20 years. Thanks for your comment. I’m happy to hear you’re interested in learning more about Jesus and the love of God. I think you should be fine visiting any church and asking the pastor your questions. Westside does have a branch in the North Shore as well. Don’t worry about your past, everyone is imperfect and thankfully Christianity isn’t about your righteousness but what Jesus Christ as the Son of God did. The Bible says in Christ you are a new creation and the old is gone. It doesn’t mean that sin and actions do not have their consequences but you have a loving Father in heaven who has justified you (for sin has a debt) and He cares and loves. Lynn- check out Westside north shore. We would love to have you. We meet now at 9am and 10:30 at park & tilford movie theatre Sunday mornings. As soon as you enter you’ll see our connect center where you can find out more about the church, Sunday school classes for kids and many amazing programs for adults. We’ve been attending just over a year and absolutely love it. Coastal Church Vancouver is one of those “truth is a commodity” churches. It’s not about the true search for truth within yourself. They believe if you’ve got enough money you’re a Christian and a great one. I attended the church a short time. I left because the pastor, Coop, believed in something so far from the truth of Jesus Christ. He discovered I was an abuse survivor and promptly told me I was NOT welcome in any ministry until I was fully healed. Pure poppycock! I have since learned that one never fully heals from abuse. Grief never ends, it lessens over time. That’s the norm for humans, Christian or not. I eventually found a great church at Ladner Christian Fellowship in Ladner, BC. Genuine teaching and fellowship. I stayed there until I moved out of the area. Thanks for your feedback. I am sorry to hear about your experience. I’ve only been to Coastal twice and didn’t get a full experience. Happy to hear you’ve found a good church to grow in and serve. First of all, I am very sorry to hear that you had a negative experience with Coastal Church. However, I would like to respond to some of your comments. And for the record, I have been attending Coastal for over a decade but I am not employed by Coastal nor do I speak directly for any of the Coastal ministry team. Your comment regarding Coastal being a “truth is a commodity” is misplaced. Coastal most certainly does not claim or believe that “if you’ve got enough money you’re a Christian and a great one” or anything close to that. Coastal is firmly planted on Jesus Christ being the only way to salvation, and money does not play into that. Having said that, I myself have observed that some at Coastal do cultivate relationships with wealthy and powerful people in Vancouver. I can’t deny that this can lead to a sense of favouritism at times. I also know of some at Coastal that have felt slighted because of this. I wish I had a better response for this or explanation, but I don’t. As for you being “abuse survivor and promptly told me I was NOT welcome in any ministry” I could see this happening but not in the blunt that way that is implied by the statement. I don’t know anything about you or your situation (apologies for not having a less vague term for that), and I wouldn’t dare to comment on that. However, I can say that the Koops are indeed very careful about who they place in any form of a ministry position. One can debate the pros and cons for that, but either way that is the reality. I would be very surprised if Pastor Koop said it in such a blunt and uncaring way. But, obviously, I can’t speak for him or this particular situation. I do know that they try to get a very good sense of everyone that takes a ministry role, and sometimes they simply don’t feel it is a good fit for whatever reason. One thing to keep in mind is that the Koops, the Coastal ministry team, and indeed all of the members at Coastal are not perfect. Everyone there is human, and as such is prone to failing, falling down, messing up, being biased, and hurting other people. One thing I have always loved about Coastal is everyone (including the Koops) seems willing to acknowledge that and try to work together to be better Christians. It doesn’t always work out, but we still try. Coastal’s “Make the City a Better Place” motto is very much meant to include ourselves in becoming better. Is Coastal perfect? No, although in some ways that is the point. Will everyone feel at home at Coastal? Unfortunately no, but Coastal tries hard to make everyone welcome. Does attending Coastal mean you won’t see shortcomings in others? No, but again that just means we are human and struggle with things just like everyone else. I have attended many churches in my lifetime across the world, and I have found Coastal to be one of the best churches that I have belonged to. People there try to be including and friendly, there is a great support network for getting involved, and the worship is great with lots of energy. Again, I am sorry that your experience with Coastal wasn’t positive. Thank you for your thoughtful insights onto the matter. As mentioned, I did not have enough experience at Coastal Church to touch on the matter. I do especially like the reminder that we as the Body are still humans and susceptible to mistakes. Thankfully, there is always mercy with repentance and our identity is already found righteous in Him. Fact is, how we treat others matters. I have learnt however that God cares dearly about how we treat other brethren. Each day that we walk with Him and seek Him through His Word, prayer, and communion, we live as better Christians. Our standing never changes, once you accept Christ you are perfectly righteous in Christ before God; justified and forgiven of all sins. However, the reality is our daily work and life is a process, regeneration if you will, only by the Holy Spirit for as He gave us the grace to accept Christ for salvation. Once you’re adopted to the family, your name and identity changes to the family’s name. However your stature and walk is a process once you’re in the family. I would think, the very fact we to realize and see our imperfection in light of His perfection is indicative of our being different. I have observed your observations as well. It is important we avoid showing favoritism (James 2). Indeed, money is a useful tool for serving people but we should never forget that God looks at the heart. I’m surprised one of the fastest growing churches in Canada is not on here — Village Church in Surrey. It’s a plant from South Delta Baptist Church (in Tsawwassen), started in 2010 with well over 4000. Village Church is along the lines of Westside (mentioned above), to the extent the lead pastors of both churches have swapped speaking at each other’s churches. Village Church has grown in leaps and bounds through many baptisms — these can often be seen at the White Rock pier. They have 4 services at the main site and 3 others between two other sites (Pacific Academy auditorium and in Langley). With a total of 7 services altogether, 3-4 of them will be live, the rest are videoed and shown at random sites/times. They go through books of the Bible for their sermon series. It’s a church with many young adults. The lead pastor, Mark Clark, and the others who take turns speaking, bring the Bible to life by making it relevant to today’s society / life. They target young families, mainly dads. They want to teach dads to step up for their families, communities and church. And the worship is not ‘good enough’, because of its size, the church has fantastic players doing their best. The worship pastor is very sound doctrinally himself. I am sorry if you got the wrong impression that I was looking only to share about the biggest church in Vancouver. On the contrary, a large church does not imply a biblical church or a flourishing membership. What matters as you know, is how Christ is glorified and how well is the flock. I was simply trying to share base on personal experience of some churches I was familiar with that upheld to Biblical truths. In hopes to hopefully help others looking for a good church to get connected with. Great to hear about the Village Church however. I’m not too sure if this is a spam comment however the URL has been removed because Haiti%20mission was the link which did not lead to any website. I commend the author for starting this platform. I am a member of Cityview Church on Sophia and 28th Avenue near Main Street. Trevor Josh is our pastor for almost 6 years. We are a small church with a huge heart where authenticity and love for each other is the first thing people have noticed right away. Came across this site by pure accident because I was looking for churches I could start a conversation regarding social isolation. PS: I have enjoy reading all the posts and comments. Thanks for sharing about Beyond the Conversation. I am glad to hear that you enjoyed reading the article and the corresponding comments. It’s very cool to learn that you’re keen on getting people and the Church connected in Metro Vancouver. I am planning on moving to Vancouver by May of 2018, and as I searched for churches in the city, came by this blog and forum. Thank you Brother Benjamin and the team at Vancity. You relate to people with genuine Christian love and attention. God bless you all. I wonder if I can be connected to a church or ministry to serve with when I move over. I currently pastor a young church here in Lagos. Sorry about the late response to your comment. I’m glad to hear you’re planning on moving to Vancouver by May 2018. Happy to hear as well that you found this content to be useful. It is my pleasure to share my dabble of opinion on this article, personally. While it may be difficult to convey love and attention, I’m happy to hear it came through online. Are you asking about finding a church to be connected to and attend when you’re here or a church to serve in as a minister? If it is the first, I hope the information above may help. If it is the latter, I do apologize I am not able to assist further. However, if you do require some assistance getting settled in Vancouver when you arrive, we’d be happy to help if we can. Feel free to use the contact form here when you do arrive in Vancouver! We can help you get connected with the professionals or information you would appreciate or assist any other way able. Sorry about the late reply. I have a practice to respond to every comment from a brother/sister whether by email or reply; I did remember writing a reply but must have saved it in draft somewhere instead of posting. Apologies about only getting to your question now. Absolutely, I understand what you’ve mentioned about the worship being very important to hearing the word preached. I believe that is something innate was music was designed to help our mind and spirit connect with God as well. (2 Kings 3:15) Worship and music is always important and should not be under emphasized. I’m not very familiar with churches in Coquitlam, East Burnaby, or New Westminster that do so however. Westwood Community Church does focus on free-flowing worship which perhaps you might be interested checking out. Perhaps someone else can help you with this. I have a few friends who attend the Salvation Army Caribou Hill Church as well. There’s also Christ Commission Fellowship which is a plant from a church from Philippines. Broadway Church also has an extended worship service the first Sunday of every month if I’m not mistaken part of their “dynamic spirituality” emphasis. Hope you find the right church for yourself. I am a believer, I am an Iranian and a refugee in Turkey. I need help, but I did not find any donation charity. please guide me. I wrote here because I asked God for help and I want it. Apologies about the late reply. I hope you’ve managed to find the assistance you needed by now. There was little I could do to help anyways as I’m not familiar with the refugee system and process neither my area of expertise – neither familiar with Turkey. It would probably be better for you to get in touch with a local church in Turkey who might be able to help you more practically than from Vancouver. I’ve become born again and saved almost 3 years ago after spending many years in the I cult. I am searching for a Church that practises deliverance and operates under the gifts of the Holy Spirit through the five fold ministry. David Wilkerson is my favorite Preacher. I have attended a few churches in Vancouver but I haven’t found what I am looking for. I’ve attended Grandview Apolostic Church which appeared to have everything I’m looking for but they support a Oneness view and I am a firm believer of the trinity. I want to hear really convicting preaching that focuses on hell, sin, righteousness and holiness. Can anyone perhaps point me in the right direction and help me find such a Church? Thanks for your comment. I’m happy to hear that you found the truth of Jesus Christ and became a born again Christian. If you’ve found Grandview Apolostic Church to be everything you’re looking for but the believe of the Trinity vs. oneness then perhaps stay at the church if you see God to be leading so and instead pray for the leadership in love and grace. A popular Christian band, Phillips, Craig, and Dean used to have the oneness believe (if I’m not mistaken) as well but were corrected on their viewpoint. So long as everything else is Biblically adhered to and the leadership is humbled, I believe God corrects. (and importantly you know what you believe) In wisdom, it may not be best to speak directly with the leadership as some church may view this in err. I believe God can always correct and lead a humble heart; it is our own pride that keeps us in err. Unfortunately, I am not familiar with any churches that emphasize on deliverance ministry in Vancouver. You might be looking for a Pentecostal church which does emphasize on the spirituality elements of Christianity especially pertaining to the gifts of the Holy Spirit. I would suggest perhaps visiting Broadway Pentecoastal Church to seeing if you like it? Apologies I couldn’t be more help. This is what I was taught and it seems Biblical. Hello and thank you for this post. It seems the comments have stopped since last September but I’d to leave one anyway. I too have been searching for the “best-fit” church in Vancouver but am slowly arriving to the conclusion that I will not find it. This is why I consider most helpful your reminder to keep your brain engaged during fellowship. While every believer belongs to Christ, and we are told to be loving in our disagreements, no congregation has the right to tell us how to think or what to believe. Yes. Came to that conclusion as well after searching around for a home church. Glad to hear the reminder was useful. We should always esteem a Biblical teacher with the right motives/heart but always think for ourselves checking with the Word as the Bible says. No man can override the Bible – the Word became flesh and dwelt among us (John 1:14) referring to Jesus. That’s true as well. There may be disagreements but we can lovingly correct each other in Christ. What’s important is approaching with meekness and a heart of love. Thanks again for your comment.